If you are reading this, don’t tell your mother. She will probably have palpitations at the thought of speed flying, let alone the fact that you are reading this and perhaps even considering having a go yourself. The best way to describe this fairly new sport is visually. The video above which will have your chin meeting the floor is Alain Montant, sliding down the lines of a cable car in Chamonix. The words mad fool spring to mind, followed quickly by give me a go! It is also known as ski-base and speed riding. Here, Mattias Giraud displays his skill with a Ski-BASE triple backflip captured in 960p that has to be seen to be believed. Hold on to your hats. It is almost as if there is a switch in your head that you have to click in order to get in to the mentality to do this thing – and this video imagines it in exactly that way. As winter sports go this is a long way from being accepted at the Olympics as it is considered way too dangerous. 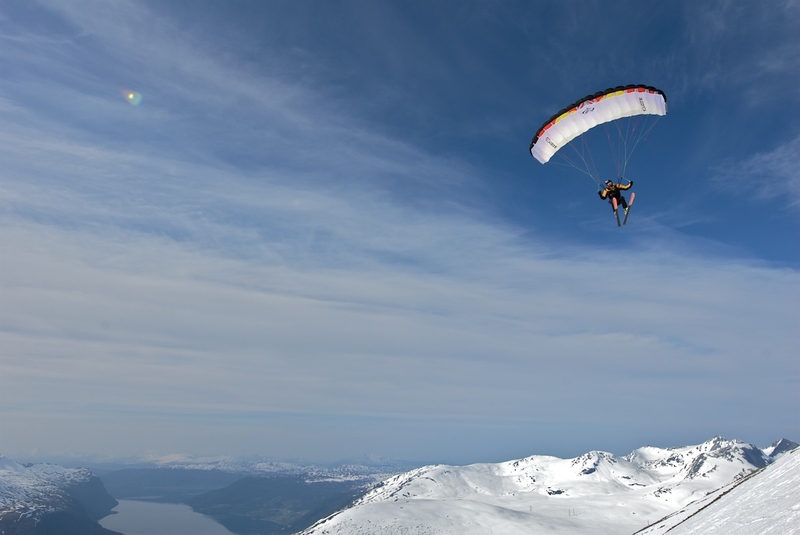 It was created by skydivers and paragliders who were looking for new sensations – and they certainly got one too. They wanted to create a link between gliding through the air and gliding by ski. They got it right. The sport has now developed. Where once the paragliders modified their own equipment, now you can buy SpeedFlying wings and gliders. Here is a compilation of the progression from skiing to skiflying. You have to wait a minute or two but then the videos of these guys simply propelling themselves off the edge of cliffs is something awesome – you have to see it to believe it. Ultimately, you might think, who needs skis – or snow for that matter. Come forth the new generation of wingsuit flyers who are ready to take things to the next level. This is a collection of shots from flights made by guys called Robert, Jean Noel, Ludo and Halvor during the 2009-2010 season, while flying the V3 and testing several new V-series wingsuit prototypes around Europe. Holy cow.